Regular readers of the ~Streetlamp~(or even casual readers for that matter), may find the music that we write about often falls into the wistful, melancholic or even depressing categories, being that we tend to write about either 'outsider' music, angry protest music, loner/bedsit music, or that we write about songs that seem to relate to us only because the remind us of times we got our hearts broken or which now make us teary eyed with nostalgia. And you'd probably be right! So taking all that into account, I've decided that tonight I would write about a handful of songs that actually make me happy. In fact they make me VERY happy. Well, let's be honest, in a couple of instances they make me laugh out loud! Something that doesn't happen too often I'm sure you'll agree. First up is Jackie Dennis with 'Lah-Dee-Dah'. So....why do I find this so amusing? Well, in truth, I don't actually find the song all that funny, although from a distance of some 53 years(yes, really! It was released in 1958!!) it does sound a little odd, and certainly toothachingly twee, but here's why I like it and why it cheers me up no end: Imagine if Doo Wop music did not evolve from the black areas of America but from the suburbs of Scotland! Imagine, say, if Frankie Lymon had hailed not from the Bronx but from the Gorbals! 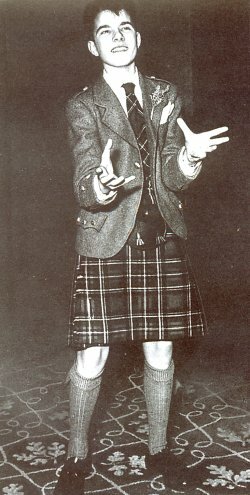 Yes, we are talking possibly the only example of Scottish Doo Wop music that ever bothered the charts(it reached No.4). The song does have all the hallmarks of a typical Frankie Lymon song except for the rather unavoidable Scottish accent running through it. Jackie Dennis came from Leith in Edinburgh and was only 15 years old when he recorded and performed this track, and I've only ever seen filmed performances of it, I don't think I've ever heard the song as a stand alone track. This is one of the reasons I find it so funny. Take the clip I've chosen below(and don't worry, the song doesn't last over 7 mins, it barely lasts 2, but the entire clip does), this from a movie version of the TV show 'The Six Five Special' which was a popular British programme which highlighted new Rock'n'Roll acts, although to be fair they were more skiffle and ballad based songs. There are several things I find funny about the clip, such as who on Earth choreographed his moves? And why aren't the girls sitting watching him pishing themselves laughing? I mean surely even he must know he looks ridiculous...have you ever seen such self-conscious gyrating? 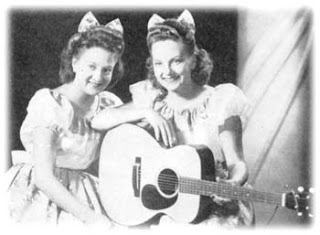 Next we have the charming DeZurik Sisters, Mary Jane and Caroline and a song from even further back in the mists of time. It's all the way back to 1938 this time for a spot of old time authentic Hillbilly music called 'The Arizona Yodeller'. Well....I say 'authentic', but I'm guessing you've probably never heard anything as bizarre as this in a long time. Whilst the song's structure is as straightforward as any Country/Bluegrass original, it's the distinctively unorthodox vocalising that makes it stand out; the freakishly fast yodelling coupled with weird little chirps and hiccups make this one of the funniest, or should that be happiest sounding records I've ever heard. Seriously, if those doesn't make you smile then I pity your Calvinist upbringing! Just as Mozart claimed he used the patterns of bird song to compose his symphonies, or that Mateo Flecha used the phrase 'riu chiu' to represent the sound of the nightingale, so the DeZurik sisters claimed their unusual vocal approach was intended to give the impression that they were singing along with birds. 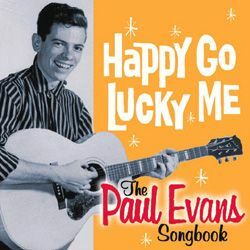 Our final track tonight is 'Happy Go Lucky Me' by Paul Evans, and once again this is a song that never fails to make me smile. It's basically the song of an eternal optimist who fails to see the dark side of anything life throws at him. Recorded and released in 1959, I'm not entirely how serious we are actually meant to take the song. By that I mean, I don't know if the song was meant as a novelty song or not, bit it often turns up on compilations of 'Silly Rock'n'Roll Songs' or 'Novelty Hits' and it's easy to see why. The vocal is punctuated with an infectious laugh which rather annoyingly becomes a little hysterical a couple of times and reduces what is actually quite an uplifting little song into a rather jokey novelty. Take the more over-the-top laughter out and you'd have a perfectly acceptable form of musical Prozac. The songs serious intentions are also further undermined by the fact that he refers to his girlfriend as a 'filly'(yep, there go the feminist readers!) but I don't suppose there are too many words describing a female loved one that rhymes with silly! Despite my apparent nitpicking at this song, I absolutely love this track and I hope it makes you smile or even laugh as much as it does me. Paul Evans wrote and recorded a whole raft of songs in the late 50s/early 60s, most of which didn't take life(or music) too seriously; 'Seven Little Girls Sitting In The Back Seat' being one of many. Interestingly he last entered the charts in 1978 with 'Hello, This Is Joanie(The Telephone Answering Machine Song)' which is often seen as the last of the classic 'Death Discs'.....and even that shouldn't be taken too seriously! Griff says; Let's get Dekadent!